Hi there! Can you believe that we are 2 weeks away from Thanksgiving and only 7 weeks away from Christmas! The older I get the quicker the year seems to fly by! OK, so on to my December Daily. 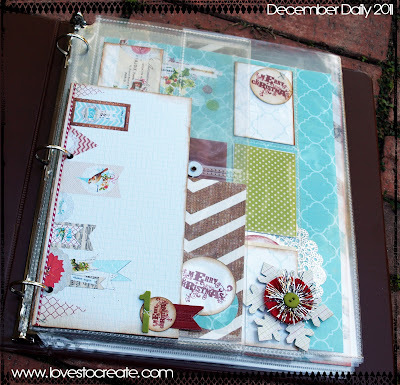 As you can see I have started the foundation pages for my December Daily and have taken very poor photos to share part of it with you today, ha! 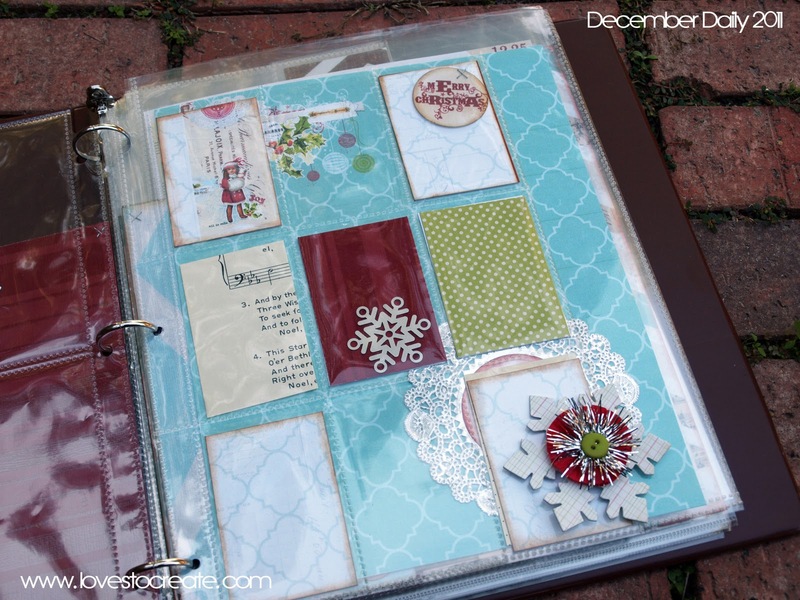 This year I am trying to be prepared and Rhonna's kits are making it really easy! I still don't even have the actual album that is going to hold it, for now I'm using a binder. I have chosen to do an 8.5x11 album this year, I say that as if I did an album last year. I did not, ha! My pages area going to be similar for each day as far as set up goes. I am simply printing and cutting out paper and slipping them into the photo protector pages. 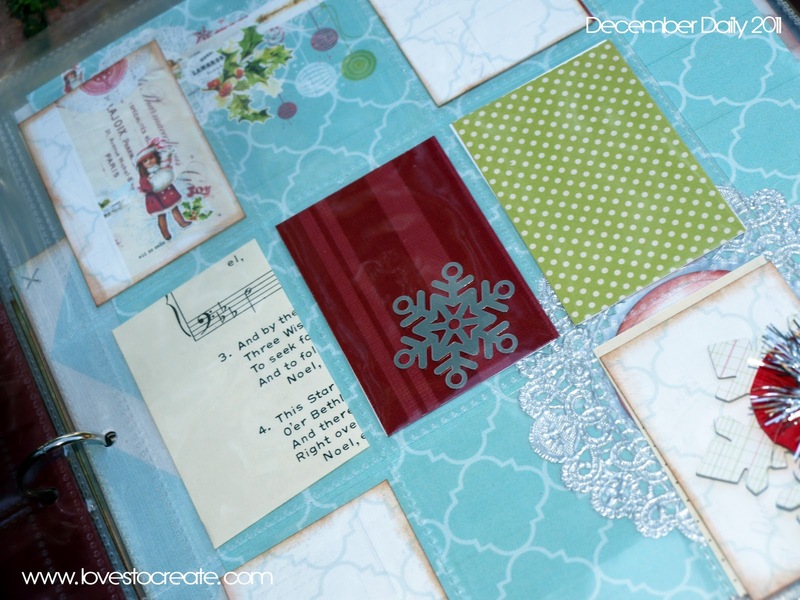 I did create some daily dividers, which were inspired by Ali Edwards! 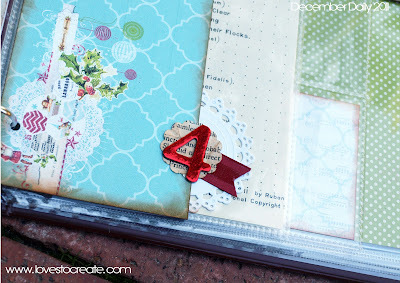 I used some distressing ink on some of the paper and pulled out some of my last years stash from the Girls Paperie. 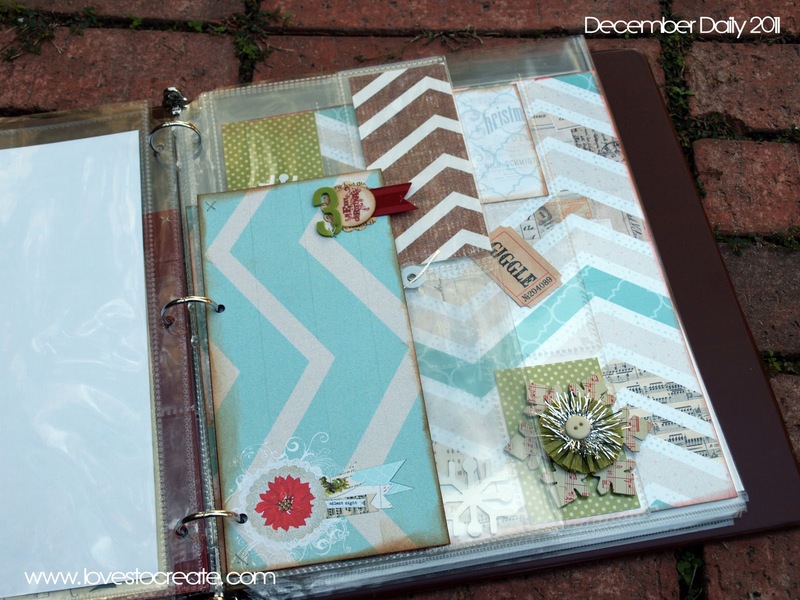 I love using digital files along with items that I have from kits and my LSS. Hybrid scrapbooking is awesome! For me it has to be sweet & simple in order to get it done in time and to follow through. 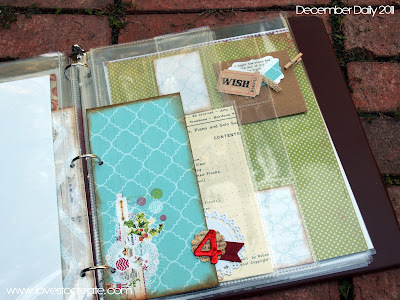 I want the journaling and the photos to be the true stars of the pages. I will be doing some custom designed pages using digital elements from Rhonna Designs as well. But for now I wanted to share the items that I simply opened up and printed out. 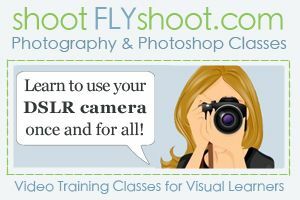 Using digital files is truly that simple, I promise! So on the page above I will most likely add a photo and a journaling spot. That is a silver foil doily above, love those! I have to tell you that I was so excited when I realized that I had an old music book full of Christmas music, what a score huh! I love checking used book stores and getting them very inexpensively! I plan to use the 5x7 pockets, shown here with the music paper to hold one photo on one side only. 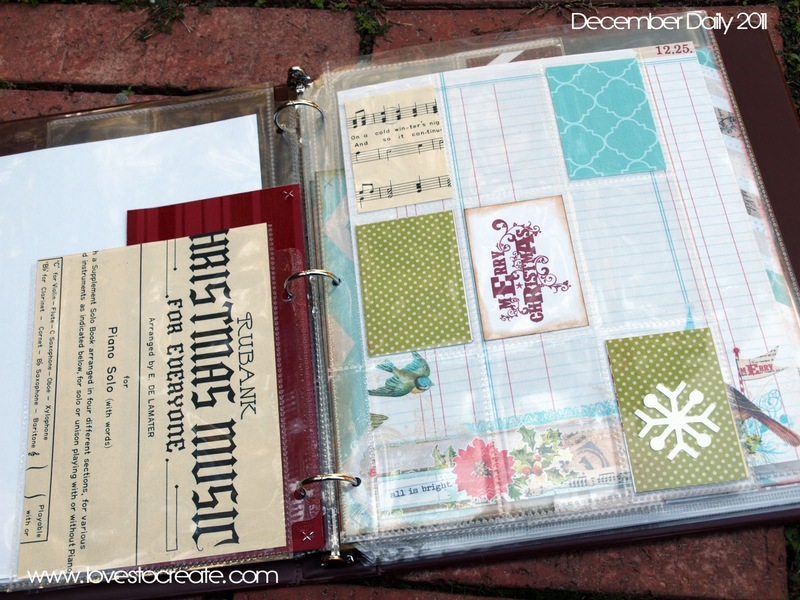 And for the page with 2x3 openings I will do some journaling, a photo or two and extras like receipts. Only time will tell. And I will most likely print out a photo in a larger size and simply crop out a section of it I like. All that layering above makes my heart happy! Can't wait to add more to it! Little pockets like the one above on the left will hold a special note or item, meant for Andy and I only. 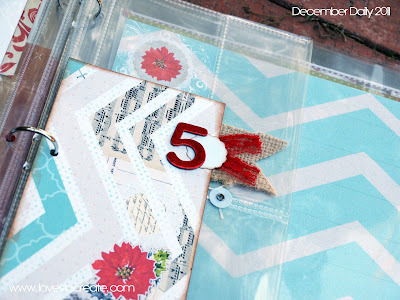 Love using scrap pieces of paper and other bought items from my stash to decorate the date. I am using fonts from American Crafts so far. Above I used some scrap burlap and ribbon I had on hand. Only time will tell what will make it into those open spots in the pocket protectors. I had some metal snowflakes on hand (have been hoarding them for years!) and so I slipped some ﻿in here and there. This is it for now, going to keep working on it and so I have promised myself that by Dec 1st it will be ready for me to start adding photos daily and documenting our days! 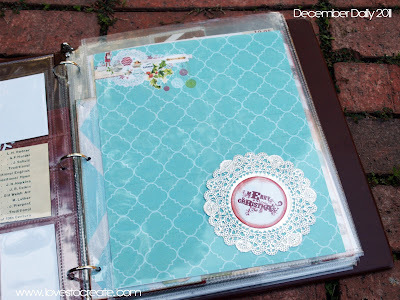 ***Edited in at 3:30CT 11/9/11 The page protectors used in my album are from Pink Paislee House of 3. Sadly they aren't for sell anymore, at least I haven't found them. Sorry for the tease!! Be sure to check back in for more as I will be adding some more printables and I will also be creating some custom pages. Enjoy the rest of your week! 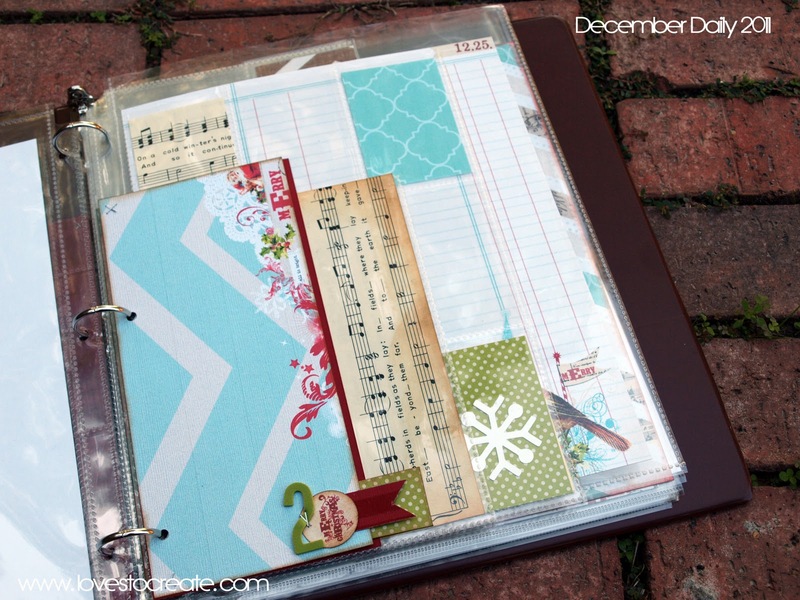 I absolutely LOVE what you have so far of your december daily! i missed out on the ali edwards/studio calico kit && have been looking for products to use, and this may have solved my problem, I LOVE the patterns!!!! where did you get your page protecters && pockets??? 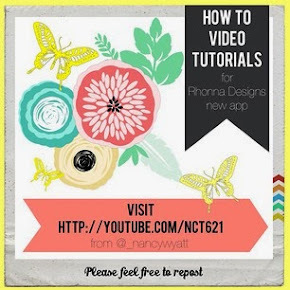 ?thanks nancy! oh.my.gosh.adorable. you need to be teaching classes at spark! ;D love every bit of it. have you used the ali edwards template thingy she has on her site?? why did i never even know this woman existed until like 2 days ago?? probably good for my hoarding issues that i didn't. ;D anyways, i was wondering what those were exactly and if you had used them oh scrapbook diva. I'm loving what you have so far. It's a great idea - wish I had some grandchildren this would be perfect. Nancy girl...I'm loving this!! The layers!! So lovely! I am also wanting to make a book of sorts...where to start where to start!? Sheet music sounds like a good place! Thanks for sharing your pretties!! Barbara- You don't need kids to do this, we don't! Girl you are better than me. I am still getting over all the work on the fall festival!I did manage to try and do a collage via Christy Tomlinson video on My Craft Channel...a Christmas one. Love, love your December Daily!!!! it looks great...your layers make my heart happy too! i too have started my foundation pages using the christmas junque kit for the papers. adding stash here and there as i go. loving the layers in your book. so very eye catching. great ideas you are implementing. 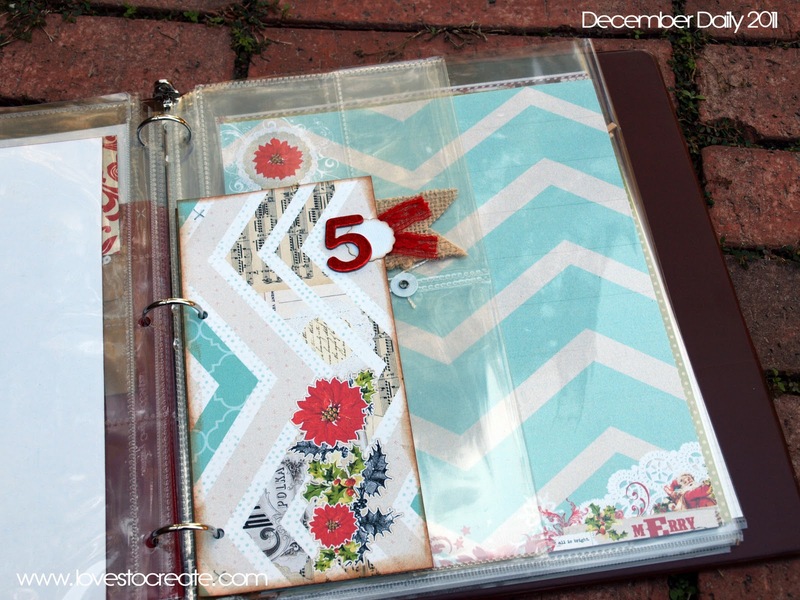 i too am inspired by ali to do the page/day separators. that is next on my list of things to do today on my book. you can catch a glimpse next week. i really want to relish the thanksgiving season right now, but it's important to get the foundation pages going in the dec daily or one finds themself getting behind. I am so impressed ! I love the colors you used, it is perfect! Love the number dividers! Gorgeous album. LOVE LOVE LOVE this!! I happen to have the album and protectors from house of three YEA! 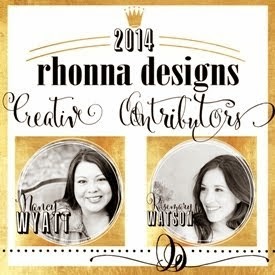 I have never used digital files but after seeing this I am going to purchase 2 of these files from Rhonna Designs. Can you give me some tips on how you printed these pages? Do you just use white cardstock to print them? 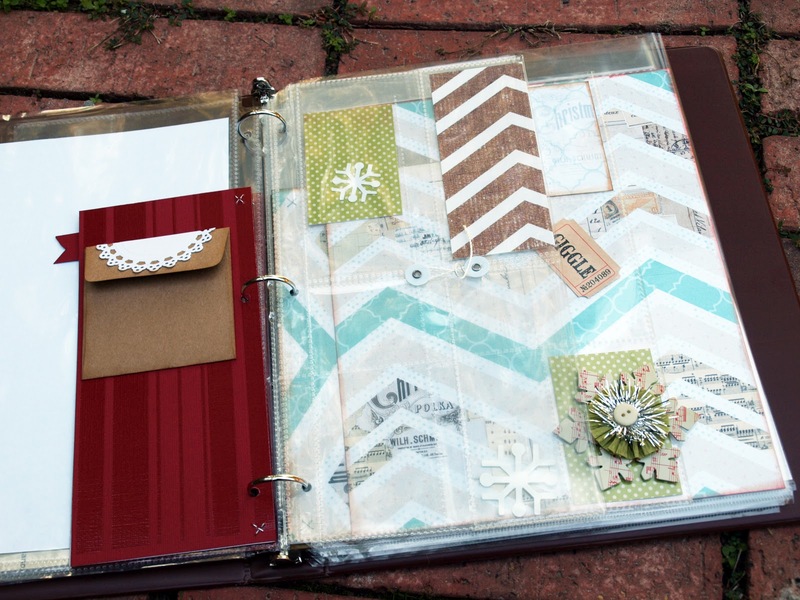 Were the dividers printed on cardstock and then adhered to chipboard? Will there be any directions on how to do the printing of digital files that come with the files? HELP! Thank you for any advice. Your album is so beautiful and you haven't even added the pics or journaling yet.